There’s more to rehab than attending group, family and individual therapy sessions. At Woodlands Recovery Centers, we like to include more hands-on approaches to therapy. One example is our yoga therapy program. Discover what yoga treatment is and how can it help people manage their addictions. Yoga therapy or rehab is a program that uses yoga to help people deal with certain aspects of addiction. It falls under the category of experiential therapy. Some other types of therapy that fall under this category include music and art therapy. While people can do other physical activities to get the same benefits, yoga is still a popular option. One reason why is because it’s an activity that nearly anyone can do. No matter a person’s physical strength or age, yoga is typically an option. One of the major benefits of yoga is its ability to teach coping mechanisms. At its core, addiction stems from people’s inability to deal with certain emotions or thoughts. However, coping with these issues can keep them from using or relapsing after rehab. Yoga helps people deal with stressful situations via breathing exercises and mind-body connectivity. Learning to breath can help them gain control of their emotions under stressful circumstances. Yoga is also a great hobby for them to practice. In fact, Woodlands Recovery Centers recommend that they keep doing yoga even after they finish rehab. Another reason why people turn to drugs is because of guilt or anger. Dealing with guilt is hard, and people find temporary relief from drugs. To keep achieving temporary relief, however, they have to keep taking drugs. Eventually, abusing drugs turns into a full-blown addiction. It’s important that people learn new ways to center themselves and achieve inner peace. Yoga can help them achieve that. 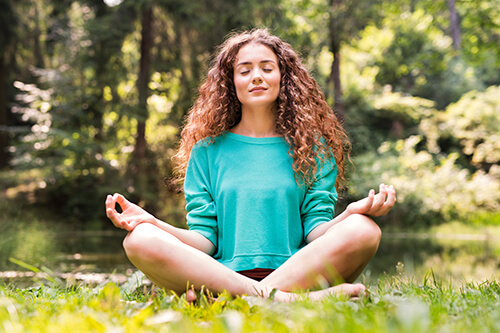 In fact, finding inner peace is a central part of 12-step recovery programs. For many people, traditional treatment alone isn’t enough to overcome addiction. Some of them have to look toward a higher power and awaken a spiritual connection. Keep in mind that a spiritual connection doesn’t necessarily involve religion. Instead, it’s more about people putting faith in something other than themselves. Finding a spiritual connection is another core value of 12-step programs. At Woodlands Recovery Centers, we aim to help people achieve spiritual connections. We believe that it can aid their journey toward sobriety. Through experiential programs such as yoga, we can help you build a strong foundation for recovery. This strong foundation can help you stay sober even after rehab. You can use yoga as a new hobby and an aid in your times of need. Find out more about Woodlands Recovery Centers. Take a tour of our Texas Rehab Center to see how we can help you. Call us today at (855) 752-3377 to speak to one of our friendly staff members.